For some, beginning high school might be exciting, nerve-racking or some may just see it as another stage in their life. For me, I was afraid of whether or not I would fit in but I still wanted to meet new people. I was also looking forward to all the clubs and societies I could participate in. I also liked the school I was going to attend because of the activities and school spirit. I even made a promise to myself to do my best academically. Overall I was really excited to start high school. Is there anyone that went to your primary/ prep school? In celebration of Child’s Month, Breadknife Productions, publisher of children’s short story We Don’t Hate Mondays Anymore has made the title free for the period May 16 to 20, 2016. The title was published in December last year and has sold several copies in print at both primary and preparatory schools in Kingston. The first in Breadknife Productions’ Peculiar Kids series, We Don’t Hate Mondays Anymore is the compelling story of how best friends, Jaime and Joanna experience and work through the troubling issue of bullying. “We have been very pleased with the feedback from children from various demographics. Children from different backgrounds have come to me to say how much they enjoyed the book,” said author Shelly-Ann Harris. Educators have also expressed their delight with the children’s book, noting how relevant the topic of bullying and the suggested solutions are. “That is why I want to make the kindle version of the book available to children, parents and teachers free for a period during child month so that we can foster instructive discussions on bullying ” Harris explained. Readers can download the e-book for free at Amazon.com. Children now have a new exciting wholesome storybook to enjoy over the holidays and beyond with the publication of the new title We Don’t Hate Mondays Anymore. Published by Breadknife Productions under its new Peculiar Kids series, We Don’t Hate Mondays Anymore is the compelling story of how best friends, Jaime and Joanna experience and work through the troubling issue of bullying. “We wanted to address the universal issue of bullying in a way that children would both enjoy and learn from,” says Author and award-winning writer, Shelly-Ann Harris. Harris who is also the Editorial Director of Family and Faith Magazine and a Board Director at the Women’s Resource and Outreach Centre says the book is ideal for children from all cultures and nationalities. The children’s publication was positively reviewed by children and edited by veteran elementary school teacher Ermin Mair. “We Don’t Hate Mondays Anymore is exciting and empowering. It is a fun read for children, “Mair says, who has taught children in the United States and Jamaica for over 30 years. 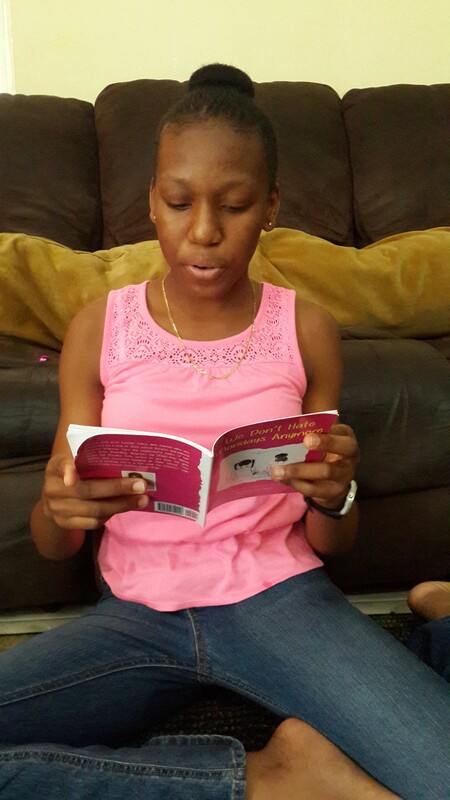 “When I started reading I couldn’t put it down,” she adds. The new publication is available for sale worldwide as an e-book or in printed format via Amazon.com. Journey with best friends Jaime and Joanna who are tormented by a boy at their school they’ve nicknamed Monster Marcus. 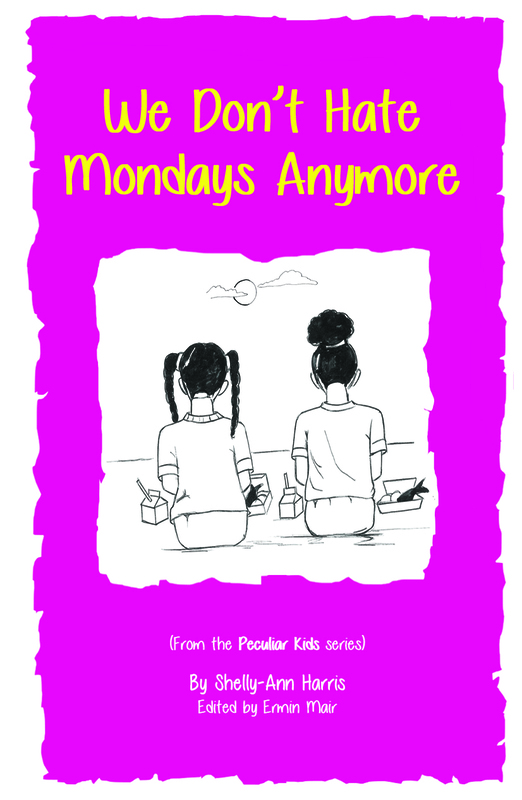 Turn the suspenseful pages of We Don’t Hate Mondays Anymore by Shelly-Ann Harris (from the Peculiar Kids series) to see how the girls suffer and overcome bullying at their school. It is a fun read for children, “Mair says, who has taught children in the United States and Jamaica for over 30 years. “When I started reading I couldn’t put it down,” she adds. It was a rainy Monday morning and Jaime awoke with a fright. Sweat glued strands of her black curly hair to her knotted forehead. She had had another dream that Monster Marcus would massacre her stuff, again. We called him Monster Marcus because even though he was our age, he was much bigger than us – he was as tall as the boys in high school and had a nasty temper. Nobody knew what he was so angry about or why he picked on Jaime so mercilessly. Monster Marcus would grab Jaime’s lunch bag and empty her fry fish and dumplings into the garbage bin next to the playground. He and his rabble-rouser sidekicks Rainford and Duke would then point and laugh so hard, all the kids on the playground would turn around and see me and Jaime scuffling to hide behind the canteen, again. Oh for the ground to open up and swallow us whole. No such luck. We would stay there, hurt, afraid and embarrassed, until everyone went back to classes…. I use to write as a child.